How Articles Can Boost Your “Expert” Level. Position Yourself As An Expert in Your Industry and Move your Website Up the Rankings. 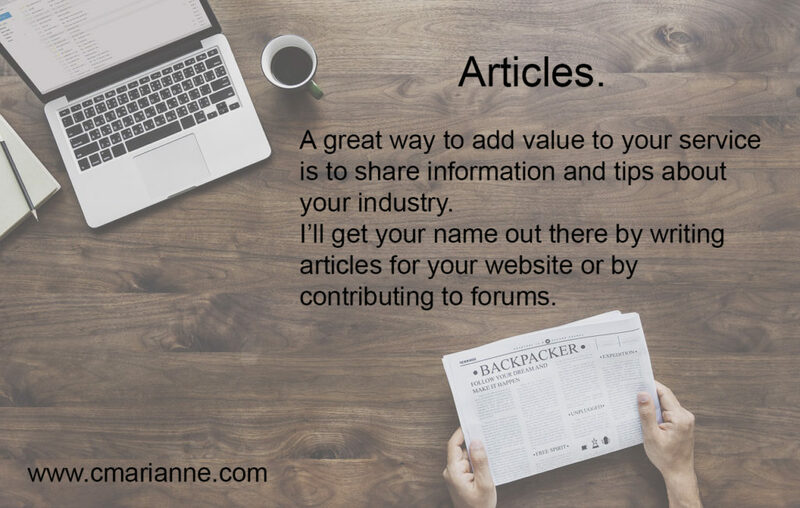 Articles on your website, on specific pages or in your blog, are a great way to get your industry knowledge out there. Ask me to tackle any topic your customers want. As a content writer, I can write informative, readable articles. Maximising keywords and terminology unique to your industry. A series of well-written articles with a good selection of keywords will make your website move up the rankings. This means you get more traffic to your website…and make more sales.